The shambolic nature of the talks process at Stormont was exposed this week when British Prime Minister David Cameron suddenly abandoned the negotiations with no plans to return. The Tory leader and Taoiseach Enda Kenny left Belfast on Friday morning amid angry recriminations over a failure to reach a deal on a range of contentious issues. Their arrival on Thursday had been portrayed as potentially heralding a final push for a breakthrough deal. The need for more British cash to sustain the Six County economy was the reason given for Cameron’s dramatic exit. But it is understood little progress was made on the range of other items facing the talks, such as flags, parades, the legacy of past conflict, or equality issues. At a joint press conference with the Taoiseach at the Stormont House talks venue before leaving, Cameron said a deal was not possible at this stage. “The real work that still needs to be done is to make sure that the budget of the Northern Ireland Executive is sustainable and works, so intensive work needs to be done between the parties on that issue,” he said. Party leader Gerry Adams strongly criticised the discussions as “the most amateurish ham-fisted episode I have ever been involved in”. The financial package tabled by David Cameron was presented separately from the other issues, and allowed for a billion pounds worth of loans which Stormont could repay (with interest) over a 25-year period. SDLP leader Alasdair McDonnell described Mr Camerson’s financial offer as “essentially junk” and more cash was required. “The papers produced by the British government do not reflect the needs of people in Northern Ireland and more particularly the needs of victims,” he said. 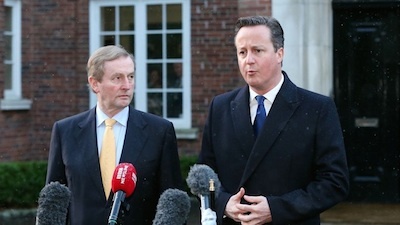 The DUP claimed Sinn Fein’s refusal to support a reduction in welfare benefits had undermined the financial negotiations, bu also criticised David Cameron. “I think if he wants to bribe us, to bribe us with our own money comes a bit short of what’s required,” said party leader Petre Robinson. However, the process has not yet been completely abandoned. Despite the walkout the five executive parties are said to be still working to avert a potential collapse of the devolved institutions. A draft document, which largely mirror the proposals put forward by Richard Haass and Meghan O’Sullivan a year ago, remains under discussion, it was reported. They include proposals for a commission on flags and cultural identity, a historical investigations unit and devolving parading powers. According to 26 County government officials, the document also included “recognition of the Irish language”. Sinn Fein said the document “fell well short” of proposing an Irish language act. “We are disappointed that the Taoiseach had not backed the commitment given at St Andrews for an Irish language act and had instead settled for some vague notion of recognition,” a spokesman said. Sinn Fein also criticised Cameron for “hiding his government’s involvement in the conflict behind the shield of ‘national security’”, such as the failure to hold an inquiry into the murder of Belfast defence lawyer Pat Finucane. However, Mr Cameron is understood to have shown little interest in issues other than the budget cuts. Adding to a sense of finality were reports of a spat between himself and Gerry Adams as he announced he was leaving. British officials were nevertheless quoted as describing Cameron’s departure as an indication of a new “ruthless” Tory approach to the process. “The days of easy money are over, people have to realise this,” one said. Unionist hardliner Jim Allister said it was time to face up to the “terminal failure of mandatory coalition”. “These talks were never about fixing what is wrong with Stormont, but were only ever about the self-serving agenda of patching it up till it lurches to its next crisis,” the TUV leader said.